Download "Economics 380: International Economics Fall 2000 Exam #2 100 Points"
1 Economics 380: International Economics Fall 2000 Exam #2 100 Points Name (ID) YOU SHOULD HAVE 7 PAGES FOR THIS EXAM. EXAM WILL END AT 1:50. MAKE SURE YOUR NAME IS ON THE FIRST AND LAST PAGE OF THE EXAM. I. Multiple Choice (30 points 3 points each) For each of the following questions, place your answer in the appropriate space on the last page. 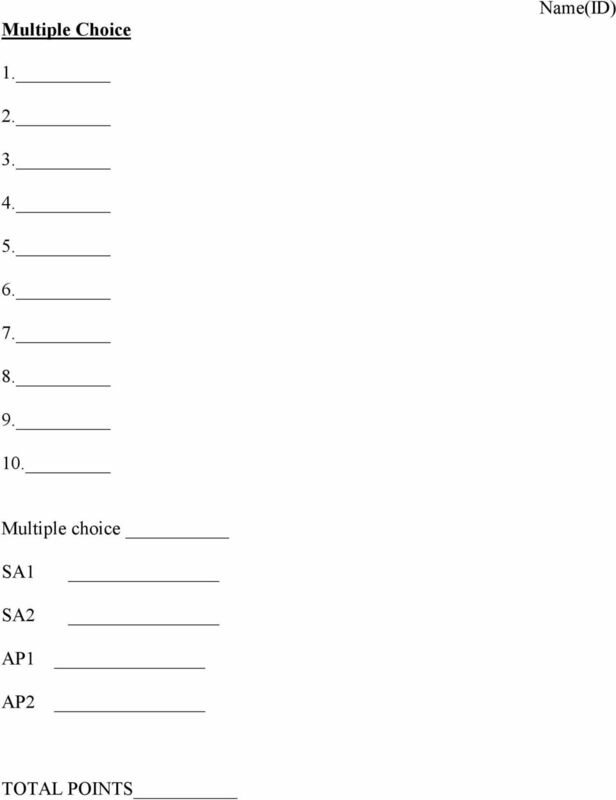 Only answers placed in these blanks will be graded. 1. The argument that protection increases total employment a. is true because domestic producers would have to decrease employment if imports force them out of the market. b. is true because foreign producers hire workers at lower wages. c. is true because we then keep the products and the payments for the products in the domestic market. d. is false because a rise in employment and output in protected industries can only come at the cost of efficient production in other industries. 2. If a US firms borrows one billion dollars in Mexican pesos from Citibank s Mexico branch and uses the money to build a factory in Mexico, the transactions will enter the US balance of payments as a. a credit on capital inflow and a debit on direct investment payments. b. a credit on capital inflow and a debit on capital outflow. c. a credit on capital inflow and a debit on goods investment. d. a credit on capital inflow and a debit on capital outflow. 3. If the exchange rate between the Canadian (C$) and the American dollar (US$) changes from C$1.340/1$ to C$1.325/US$ but the Canadian government wants to maintain an exchange rate of C$1.340/1US$, what should the Bank of Canada do? a. Stop trading with the US so that fewer US dollars will flow into Canada. b. Sell US dollars (buy Canadian dollars) c. Sell Canadian dollars (buy US dollars). d. Purchase British pounds and sell French Francs. 4. What of the following statements is false? a. British imports of Florida oranges will create a demand for US dollars. b. If all Americans decide to buy Germany automobiles, the dollar will appreciate relative to the mark. c. A change from $3/1 to $2/1 represents an appreciation of the dollar. d. The exchange rate is kept the same in all parts of the market by exchange arbitrage. 2 5. The demand curve for foreign currency slopes downward because a. at lower exchange rates, foreign goods look cheaper to home country residents. b. at higher exchange rates, the home currency can buy more foreign goods. c. the quantity supplied of the foreign currency rises as the exchange rate falls. d. marginal utility theory says that individuals substitute into any commodity whose price has fallen. 6. Dumping occurs when a firm a. sells too much of a good in a foreign country. b. sells in a foreign country at prices that are below fair value. c. sells in its home market at prices that are below the average price charged by its competitors. d. sells in a foreign market at prices that are below the prices charged by firms based in the foreign market. Use the following information in the table to answer questions (7)-(9). Exports of goods and services 1000 Imports of goods and services 800 Net changes in assets owned abroad 500 Net change in foreign owned assets at home 400 Unilateral transfers received 100 Unilateral transfers paid 200 Investment income paid to foreigners 300 Investment income received from foreigners The balance on the current account is a b c. 0 d e The balance on the capital account is a b c. 0 d. 100 e If the information in the table is typical of current and capital account values over a long period, then it would be reasonable to infer that a. the net international investment position is negative. b. the net international investment position is positive. c. national savings are less than domestic investment. d. government accounts are in deficit. e. the current account balance is greater than domestic investment. 3 10. All else equal and given the current system of exchange rates, if the US enters a period of exceptionally strong growth, a. the pressure on the dollar is to revalue. b. the pressure on the dollar is to devalue. c. the pressure on the dollar is to depreciate. d. the pressure on the dollar is to appreciate. Short Answer (40 points 20 points each) Answer each of the following short answer questions in the space provided. Be concise, but do not simply use bullet-points to answer the questions. You may use the backside of these pages if you need more room. 1) Most customs unions or free trade agreements are created between countries of close geographical proximity. Why is this the case? Is this always welfare increasing? Why or why not? 4 Short Answer #2 A nation is enriched as its balance-of-trade surplus grows, so policy should always be aimed at maximizing the trade surplus. Is this quotation correct? Why or why not? Discuss using the terminology and techniques discussed in class, including trade policy, welfare analysis, foreign exchange markets, and the balance of payments. 5 Analytical Problems (30 points 15 points each) For each of the following questions, circling the final answer to each part. Partial credit will be given, so show your work. 1. A U.S. resident can earn 6% interest on a one-year bank deposit of $100,000 at home. Alternatively, she can convert the $100,000 into German marks and earn 4% on a one-year bank deposit in Germany. The initial exchange rate is 1.5 DM/US$. a. (8 points) Suppose that she wishes to withdraw her money at the end of the year. If the exchange rate changes to 1.45DM/US$ at the end of the year, which deposit will give the U.S. resident a higher return? By how much (measured in U.S. dollars)? b. (7 points) At the end of the year, our U.S. investor wishes to travel to Ireland to visit relatives. She sees that the IR /US$ exchange rate is 0.91IR /1$, and the IR /DM exchange rate is 0.40IR /1DM, and the DM/$ conversion is 1.45DM/US$. Should she convert the $10,000 she wishes to take to Ireland directly from US$ to IR, or should she first convert to DM, and then to IR? How much does (in US$) she make/lose by converting to DM first? 6 Analytical Problem #2 Japan can produce cars for $12,000 each; the US can produce them for $16,000, and Mexico can produce them for a cost of $20,000 each. In the questions below you are asked about the effects on the Mexican economy of a free trade agreement with the United States. Assume that Mexican consumers will buy 1 million cars per year if the price is $20,000 and that every $1,000 drop in the price generates an additional purchase of 100,000 cars. a. (4 points) Before the free trade agreement, Mexico had a tariff on cars equal to $10,00 per car. What was the price of cars in Mexico before the FTA? b. (4 points) Mexico signs the FTA with the United States but retains the tariff of $10,000 on Japanese cars. What will the price of cars be in Mexico now? 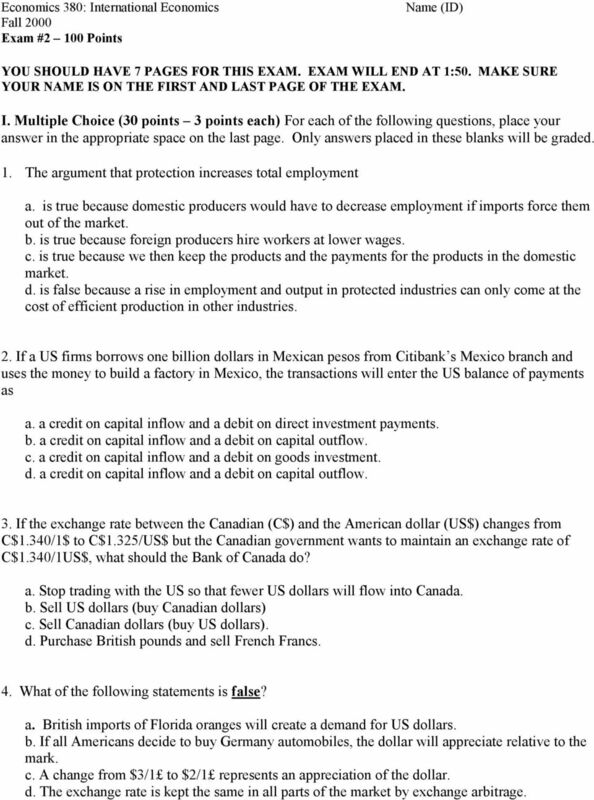 c. (4 points) What is the amount of trade diversion and trade creation caused by the FTA? Show this graphically as well as numerically. d. (3 points) What is the change in Mexico s economic welfare in going from the situation in (a) to that in (b)? 1. If net capital outflow is positive, then: A. exports must be positive. B. exports must be negative. International Trade, Comparative Advantage, and Protectionism. Trade Surpluses and Deficits. Canada s Major Exports and Imports in 1999 (Table 20.